The material of YILOONG BF squonker stab wood box mod is Stabilized Wood, aka Stab Wood, is a popular type of wood used for Box Mods, especially forHigh End Box Mods. Stabilizing wood is a process of injecting the pores and grain of wood with certain 'Stabilizing' chemicals and dyes, in-order to prolong the life of the wood and help prevent the wood from shrinking, warping, adsorbing moisture, cracking etc. Oftentimes, Stab Wood is dyed (Single Dye and Double dye) to give the wood grain illustrious colors. 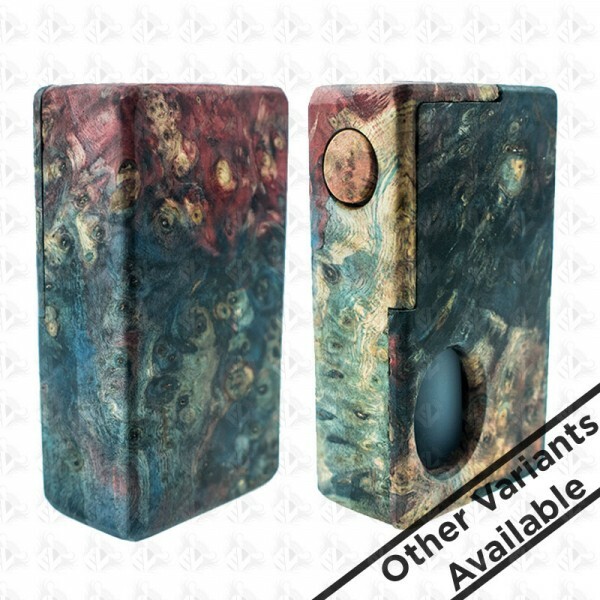 Further,Hybrid Box Mods, are part Stab Wood finish and part acrylic/resin, giving the Stab Wood a vibrant contrast and a glossy stone/glass like finish. Stabilized Wood box mods are very popular amongst collectors due to the natural beauty of wood, variance of color/grain patterns, and the unique look each build provides. However, Stabilized Wood does require some ongoing maintenance, primarily an occasional oiling and waxing.